Jenn at Just Add Water Silly is doing a big giveaway and she wanted my readers to be included in the info. 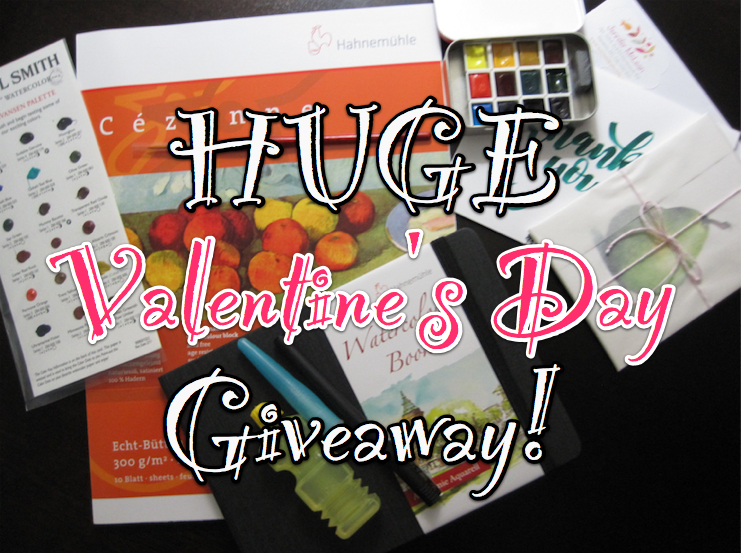 Hahnemühle has generously sponsored a HUGE VALENTINE’S DAY GIVEAWAY with a bunch of extras thrown in! She’s giving away over $120 worth of art supply goodies for one lucky winner. Maybe you’ll be that winner. It’s easy to enter, let me tell you what’s in her great prize pack then I’ll tell you haw to enter. A bag of chocolates, who doesn’t want chocolates on Valentine’s Day? SUBSCRIBE to Just Add Water Silly by going here. Then FOLLOW JENN on Instagram here. The Giveaway is open Internationally and is open from February 9, 2018 until February 14, 2018 @ 11:59PM Pacific Standard time. The winner will be picked in the 24 hours after the giveaway closes. The winner will be notified using the email address provided in the contact form. The winner has three days (72 hours) to respond to my email. If there is no response, the giveaway will be redrawn. Thanks so much Alice, you're such a good friend. All the links work, YAY. Hugs! Thanks for pointing this out Alice – quite a giveaway & such an interesting blog too.